Kevin Harvick posted a 21.722-second/124.298 mph in the third of three rounds of Monster Energy NASCAR Cup Series qualifying at Richmond (Va.) Raceway on Friday to claim the provisional pole for Saturday’s Toyota Owners 400. 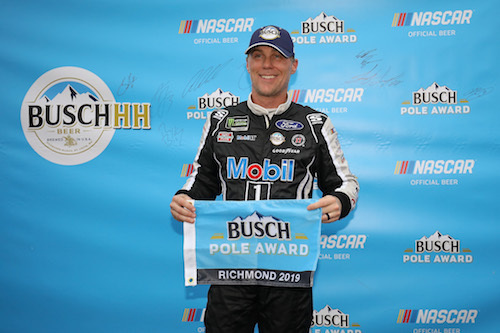 Harvick’s latest pole, if it stands, makes him the first repeat pole sitter of 2019. Post-qualifying/pre-race inspection isn’t until Saturday afternoon. Qualifying results will become official then. All three manufacturers are represented in the top-three race starting spots with Erik Jones qualifying his Toyota in the second position to start on the front row, next to Harvick’s Ford. And Kurt Busch’s Chevrolet with start third. 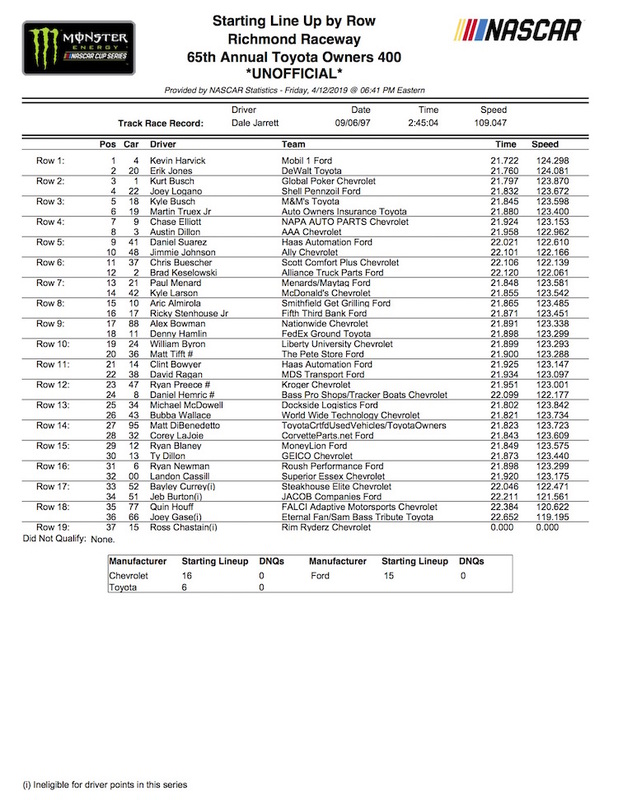 NASCAR abbreviated Friday evening’s qualifying session, cutting the first two rounds in half by slashing the time clock from 10 to five minutes in each of those rounds. In the shortened first round, Chip Ganassi Racing teammates Busch and Kyle Larson were tops, with Busch turning in the fastest lap, overall, of the qualifying session at 21.460 seconds/125.815 mph. While Busch advanced all the way through the final round for a top-three starting spot, Larson’s qualifying efforts ended in the second round. He wound up 14th after posting the fastest lap time in the only practice session and running second to his teammate int he opening round of qualifying. “I just felt tighter each run or each lap, and then the second round there, I was just a little too tight in the center to roll speed. So I had the feeling I’d be that way once the track got some rubber, and sure enough, we were just a little too tight,” Larson said. The second round of qualifying was led by Busch’s younger brother and the Cup series’ winningest driver, so far, of 2019 — Kyle Busch — with a 21.640-second/124.769 mph lap. Eventual pole sitter Harvick was second to the younger Busch in round two. Joey Logano qualified fourth, and Kyle Busch rounded out the top-five in the final round of qualifying to claim the provisional fifth spot on the race starting grid.